It's not the NCAA tournament, but the Huskies are seemingly a lock to make the National Invitation Tournament when the bracket is unveiled Sunday. 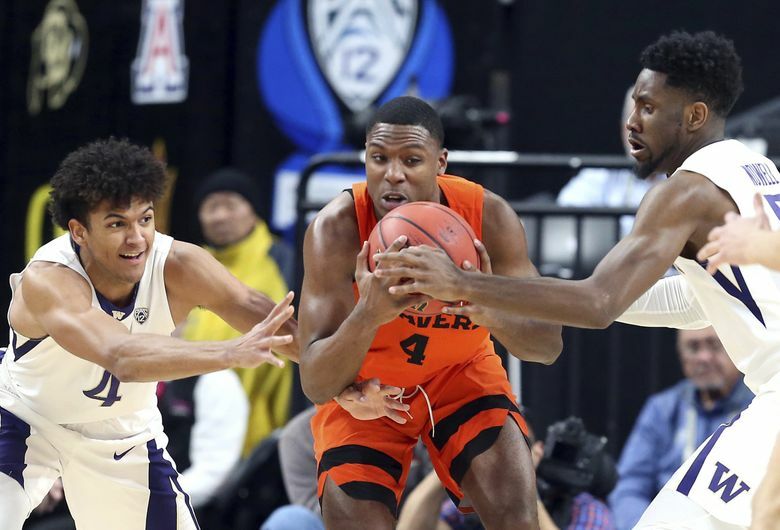 Washington’s early exit from the Pac-12 Tournament opener knocked them off the NCAA tournament bubble, so it’s time to examine where the Huskies will likely land in the National Invitation Tournament. For starters, the NIT is a 32-team single-elimination tournaments that awards automatic bids to regular-season conference champions who do not advance to the NCAA tournament. The NIT is split into four groups of eight seeded No. 1 through No. 8. The first four teams not chosen for the NCAA tournament become automatic No. 1 seeds in the NIT. These teams have clinched automatic bids to the NIT: Rider, Florida Gulf Coast, Northern Kentucky, UNC Asheville and Wagner. This year’s bracket will be unveiled 5:30 p.m. PT Sunday during the NIT Selection Special on ESPNU. And here’s a look at several NIT projections that include Pac-12 teams. All Things NIT: Utah (2), Oregon (5) and Washington (5). W, 107-102, vs. Long Beach St.
L, 93-78, vs. San Diego St.
L, 67-63, at Michigan St.
W, 98-90, at Montana St.
W, 73-64, vs. Boise St.
DRatings: USC (1), Utah (3), Oregon (3), Washington (5) and Stanford (6). Jason Wells’ Bracketology: Arizona State (1), Utah (2), Washington (3), Stanford (4) and Oregon (5). NYC Buckets: Utah (2), Washington (3) Stanford (4) and Oregon (4). RTS Ratings: Arizona State (2), Oregon (2), Utah (4), Washington (5), Stanford (6) and Colorado (8). ​— The three-point line will be extended by approximately 1 foot 8 inches to the same distance used by FIBA for international competition (22 feet 1.75 inches). — The free throw lane will be widened from 12 feet to 16 feet, consistent with the width used by the NBA. — The games will be divided into four 10-minute quarters as opposed to two 20-minute halves. Teams will shoot two free throws beginning with the fifth foul of each quarter. — The shot clock will reset to 20 seconds after an offensive rebound instead of the full 30 seconds. Here’s a look at the NIT dates. All 31 games will be televised on ESPN networks. March 13-14: 1st round at campus sites. March 15-19: 2nd round at campus sites. March 20-21: Quarterfinals at campus sites. March 27: Semifinals at Madison Square Garden. March 29: Final at Madison Square Garden.